Watain began in Uppsala, in the fall of 1998. At the feet of one of the city’s oldest monuments, three young devils were brought together by their passion for violence, fire, metal and perhaps even more so the Satanic Black metal cult that thrived around them, led by bands such as Dissection, Nifelheim, Malign and Ofermod. The first chaotic years of rehearsal demos, letter writing, editing Hellish massacre fanzine and performing underground shows culminated in the 99′ Essence of Black Purity EP. As the years passed, Watain became infamous for the antagonistic and, in many eyes, controversial approach they have always had to their work. A seemingly endless stream of dark rumours followed the band like rats following the piper – some true, some not. What became clear was that Watain was a band walking its own callous path without paying the world around them any consideration. Watain’s debut album Rabid Death’s Curse was released through End All Life Productions and Drakkar Productions in 2000, followed by a split EP with Diabolicum released through Spikekult Records. A split LP with Malign was planned in the early 2000s and supposed to be issued by Grim Rune Productions before the recording of Watain’s second album Casus Luciferi, but never got released. Watain toured Europe with Unpure in early 2002. In 2003, they again entered the studio to record their second full-length album, Casus Luciferi, which features lyrics by Necromorbus of Funeral Mist (who also produced all their studio releases since The Essence of Black Purity and played live bass for them, MkM of Antaeus and Scorn of Katharsis. The Stellar Descension Infernal Tour through Europe followed, alongside Secrets of the Moon and Averse Sefira. They also toured throughout 18 countries with Dissection on their two months-long ‘Rebirth of Dissection’ tour in 2004. Dissection member Set Teitan supported Watain in Russia in 2005 due to live bassist Whorth’s absence, and later became an official live member of the band. 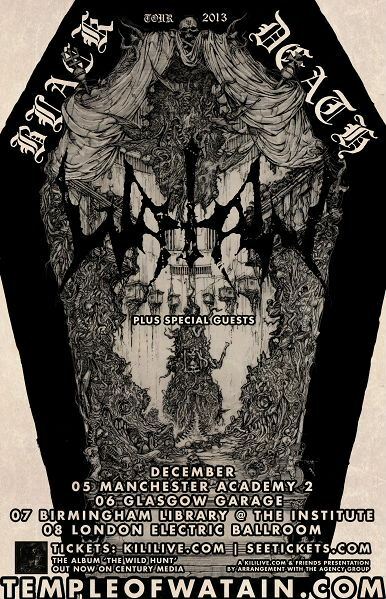 Watain and Planetmosh are giving one lucky reader the chance to win a pair off tickets to the show of their choice. [sociallocker id=”123515″] In what year did Watain form?. Send your answer to david.farrell@planetmosh.com please provide a telephone number so we can get in contact with you and your choice of venue. The competition will end on at 3pm Tuesday the 3rd December, and I will contact the winner by email or txt before 6pm on Tuesday the 3rd December.